While most immunologists accept a special ‘remembering’ memory quality, we have argued previously and document here that increased resistance against re-infection, i.e. immunity, reflects low-level antigen-driven T- and B-cell responses, resulting in elevated serum or mucosal titers of protective antibodies or of activated T cells, respectively. Periodic antigen re-exposure is from within, by persisting infection (long-term) or by immune complexes (short-term), or from without, by low-level re-infections. I will say that Zinkernagel’s arguments aren’t widely accepted among the immunological community, but it’s always good to have someone question accepted wisdom; often it leads to new findings. Contrary to the usual journalistic stereotype, though, dogma almost always wins; most people who “challenge dogma” and “overturn paradigms” are flat wrong, and “one voice battling against mainstream science” is usually just one voice because they’re wrong. A recent paper strongly suggests that, as usual, this lone voice in the wilderness is wrong. Ectromelia starts off with a localized infection in the foot, entering through cuts and scratches. After replicating there for a while, it spreads through the rest of the body, probably through the lymphatic system. It’s in this stage that it kills the mice; spleens and livers are essentially destroyed. A handful survive this stage, and go on to recover, after a stage of skin infection. Immunity to ectromelia, as with most pox viruses, is very good. Survivors are highly resistant, and (again common among poxviruses) infection with related viruses, such as vaccinia virus, confers protection. They came up with a number of interesting findings. I’ll summarize and will skim over the actual data. Memory did protect against infection. The mice needed both CD8 T cells and antibody for protection, though. These results support a model in which preexisting antibodies or memory CD8 T cells alone cannot provide sterilizing immunity but can prevent disease by delaying spread or replication of the virus long enough to give other arms of the immune system the necessary time to respond. These results are disappointing given the current interest in designing vaccines to protect immunodeficient individuals. There was no indication that persistent infection was needed to maintain the memory response. Of note, the recipient mice did not seroconvert during the parking period5 indicating that VACV had not been transferred with the CD8 T cells. This failure of memory CD8 T cells to provide good protection at the site of entry may be general because they have been shown to protect the lung but only moderately in the case of influenza virus infection and may indicate that memory CD8 T cells may not be able to prevent clinical disease in nonsystemic viral infections such as those of the respiratory tract. More or less consistent with Zinkernagel’s data, even if memory cells were present CTL didn’t show a lot of presence in the spleen until the infection was well along. Virus levels in the spleen were already significantly reduced, compared to mice with no memory cells, well before any CTL were detectable in the spleen. But by this time, CTL activity was detectable in the draining lymph nodes. As far as I can remember, Zinkernagel didn’t check the lymph nodes for CTL activity. So essentially, the model is that memory CTL do protect against virus infection because they’re present in the lymph nodes early enough, even though they’re not present in other sites. According to this model the draining lymph node is a bottleneck through which the virus must pass on its way from a local infection, to a systemic infection. By focusing attention to this critical pass, CTL can reduce (but not eliminate) the virus that goes systemic. By slowing down the infection, the rest of the immune system has time to catch up and stop the virus. 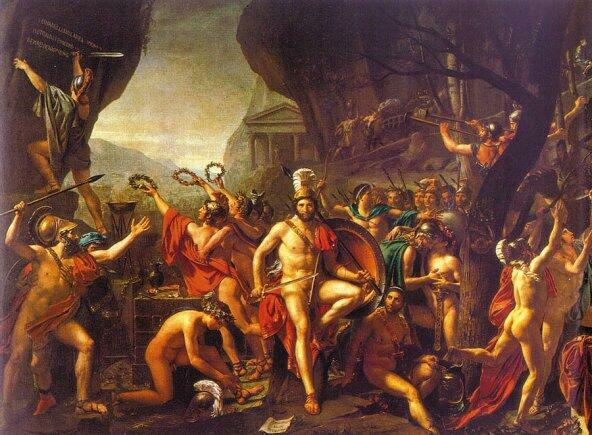 (Image at the left is “Leonidas at Thermopylae, by Jacques-Louis David.) Without the CTL, the virus just explodes and there’s too much of it by the time the rest of the immune system tries to deal with it. One caveat I have is that I’m not convinced that the draining lymph node is the critical spot. At least in this paper, it’s shown that CTL are active there, but not that CTL activity in the node is essential. It’s also possible that the virus spreads through some other route, and that other route is also blocked by CTL. In other words, I believe that Xu et al have shown a correlation between early CTL activity in draining lymph nodes and protection against ectromelia, but haven’t shown that this is causative. However, I do believe that the observation greatly weakens Zinkernagel’s argument. Another question I have is how universal the truth is. It seems possible to me that the precise timing and rate of virus replication is critical. If you slow the replication with CTL, then the virus levels are low enough for B cells to deal with, but neither CTL nor B cells check the replication enough. How many viruses replicate just that fast, but no faster? Are there systemic viruses that replicate slowly enough that CTL could stop them altogether? Or some that replicate so fast, even CTL in the draining nodes can’t catch up? Is ectromelia unique, or is it a representative systemic virus? 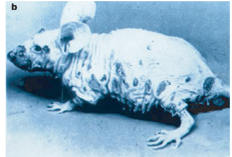 The good news is that the techniques used here, while finicky, aren’t all that specialized: Most immunologists could reproduce the experiments using their favourite model. So we’re likely to learn where this is and is not applicable over the next few years.